The sent smears along with direct and sediment smears made in the laboratory from the submitted fluid were highly cellular and comprised of 61% macrophages/synovial lining cells, 17% eosinophils, 16% small lymphocytes and 6% non-degenerate neutrophils (Question 1, Figures 1-3). 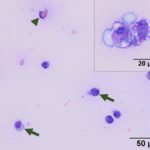 The macrophages were predominantly quiescent, but occasionally displayed phagocytosis of eosinophils (Figure 3) and eosinophil granules (Figure 2). The stippled purple proteinaceous background contained small amounts of blood and a few free eosinophil granules. Windrowing (lining up of cells in the smear) was subtle, consistent with the visual estimate of decreased fluid viscosity. A few protein crescents were also noted, compatible with the high protein concentration on the refractometer. No microorganisms were observed. Figure 1a: Synovial fluid from a horse (Wright’s stain, 20x objective). Figure 2a: Equine synovial fluid (Wright’s stain, 50x; inset, 100x). Figure 3: Synovial fluid from a horse (Wright’s stain, 100x objective). In small animals, there are only two reports of eosinophilic synovitis in a dog and cat.6,7 In the dog, multiple joints were affected and joint fluid analysis yielded a total nucleated cell count (TNCC) that ranged from 3,000-5,300 cells/uL, of which 20-55% were eosinophils.6 In the cat, only a single joint was affected with a TNCC of approximately 13,000 cells/uL of which 35% were eosinophils.7 In both cases, a cause was not found and the animals responded to supportive care and anti-inflammatory drugs with no apparent relapse at follow-up examination. In large animals, eosinophilic synovitis has only been reported in horses.2,8,9 In one of the case reports, the described horse has a monoarthropathy (right carpus: antebrachial carpal and mid carpal joints) after a post-racing, intra-articular injection with methylprednisolone acetate. The TNCC in the joints ranged from 8,300-9,200 cells/uL, of which most cells were large mononuclear cells (~75%) with eosinophils comprising between 11%-20% of the cell population,2 similar to the current case. 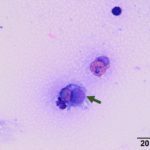 As in our case presented here, macrophages were described to have phagocytized eosinophil granules (Figure 2, insert).2 In a case series of three horses, a monoarthropathy was experimentally induced after intra-articular injection with purified streptococcal M-protein into the intercarpal joints.8 Two of the 3 horses had an eosinophilic component to the joint effusion. 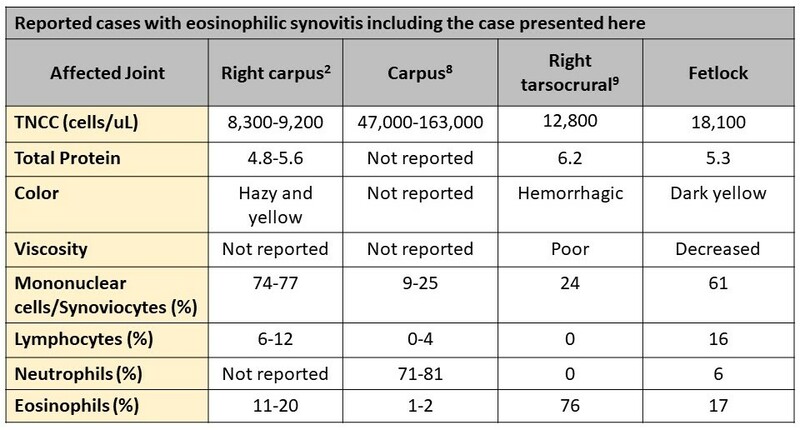 The TNCC in the synovial fluid from these two horses ranged from 47,000-163,000 cells/uL, but the cells were primarily neutrophils (71-81%) with only 1-2% eosinophils.8 The two horses with eosinophils in their joints had more severe lameness, but the TNCC did not correlate with the presence of lameness in the 3 horses. In the most recent reported case of eosinophilic synovitis, a cause or triggering agent was not found.9 The horse developed sudden lameness in the right tarsocrural joint. The joint fluid had a TNCC of 12,800 cells/uL with eosinophils comprising 76% of the cells.9 In all of the above described reports, joint lavage significantly improved clinical discomfort or lameness. Some of the horses did require administration of anti-inflammatory or immunosuppressive drugs for complete resolution of clinical signs. None of the horses had recurrence of disease or further complications, which suggests that eosinophilic synovitis most commonly affects single joints and is a self-limiting disease in this species.2,8,9 A compilation of the data reported in horses with eosinophilic synovitis is provided below. An eosinophilic infiltrate represents an inflammatory reaction to various processes, including parasitic (e.g. habronemiasis, cuterebrosis, any migrating filarial worms) and non-parasitic (e.g. foreign material, immune-mediated, idiopathic) stimuli. Eosinophils can also be part of a paraneoplastic process (e.g. mast cell tumors or T-cell lymphoma). The syndrome of equine multisystemic eosinophilic epitheliotrophic disease (MEED), which often involves the skin, gastrointestinal tract, respiratory system and other organs (see January 2017 Case of the Month), was not considered as a differential diagnosis (Question 3). This suspected immune-mediated disease has not been described to involve joints, although the complete clinical description for the patient presented here was not available. Although some authors have suggested that the presence of eosinophils within the synovial space may represent an immunologic reaction against an injected foreign material,8 eosinophilic synovitis in horses has not been linked to date to a specific iatrogenic intervention. For example, in the case reported by Climent et al9, there was no history of a previous injection into the affected joint; only cartilage erosion was observed during arthroscopic examination. The latter erosive change suggests that trauma or degenerative changes, as reported in human medicine1, could trigger an eosinophilic infiltrate. Alternatively, it is possible that the eosinophils and their related enzymes were responsible for the observed cartilage erosion. Similarly, in this case, there was no provided history of an intra-articular injection. Lyme disease has been associated with an eosinophilic infiltrate in humans, whereas the inflammation is primarily lymphocytic in horses.3,13 The horse presented here did had a positive joint fluid culture for Enterococcus spp. and Streptococcus zooepidemicus. It is possible that a bacterial antigen, such as the streptococcal M-protein, could be responsible for the eosinophils in the joint fluid of the case reported herein, similar to that described by Madison and colleagues after they injected purified streptococcal M-protein into equine joints.8 M-protein is a surface virulence factor expressed by some bacteria and viruses that inhibits phagocytosis by immune system cells (e.g. neutrophils, macrophages).14 This surface protein has been identified in Streptococcus pyogenes14 and Streptococcus equi.15 As a side note, Streptococcus equi is thought to have evolved from a Streptococcus zooepidemicus ancestor through gene loss and deletions, and genetic incorporation of mobile genetic elements from horizontally transferred genes.16,17 It is unknown if the cultured bacteria solve the mystery of the eosinophilic infiltrate in the horse presented here, as no further follow-up was available. Tauro B. Eosinophilic Synovitis: A New Entity? J Bone Jt Surg. 1995;77:654-656. Turner AS, Gustafson SB, Zeidner NS, Mcllwralth CW, Thrall MA. Acute eosinophilic synovitis in a horse. Equine Vet J. 1990;22(3):215-217. Kay J, Eichenfield AH, Athreya BH, Doughty RA, Schumacher HR. Synovial Fluid Eosinophlia in Lyme Disease. Arthritis Rheum. 1988;31(November):1384-1389. Brown JP, Rola-pleszczynski M. Eosinophilic Synovitis: Clinical Observations on a Newly Recognized Subset of Patients with Dermatographism. Arthritis Rheum. 1986;29(9):1147-1151. Christopher MM. 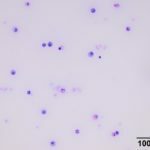 Synovial Fluid Eosinophilia : A Case Report in a Dog and Review of the Literature. Vet Clin Pathol. 1986;XV(II):25-31. Silverstein DC, Almy FS, Zinkl JG, Christopher MM. Idiopathic Localized Eosinophilic Synovitis in a Cat. Vet Clin Pathol. 2000;29(3):90-92. Madison JB, Ziemer EL, Studies C. Eosinophilic synovitis following the intra-articular injection of bacterial antigen in horses. Res Vet Sci. 1993;54:256-258. Uehlinger FD, Burton SA, Riley CB, Wichtel MEG, Bourque AC. Case Report: Cutaneous and Tendon Sheath Mastocytomas with Eosinophilic Joint and Tendon Sheath Effusions in a Horse. J Vet Intern Med. 2010;24:1233-1236. Kumar V. Diseases of the Immune System. Robbins Cotran Pathol Basis Dis. 2010:183-257. EC B, D G, JP P. Arthritis and panuveitis as manifestations of Borrelia burgdorferi infection in a Wisconsin pony. J Am Vet Med Assoc. 1986;189(10):1340-1342. Fischetti VA. Streptococcal M Protein : Molecular Design and Biological Behavior. Clin Microbiol Rev. 1989;2(3):285-314. Galant JE, Timoney JF. Molecular Analysis of the M Protein of Streptococcus equi and Cloning and Expression of the M Protein Gene in Escherichia coli. Infect Immun. 1987;55(12):3181-3187.